Good morning, my Cutting Edge Stencils friends! 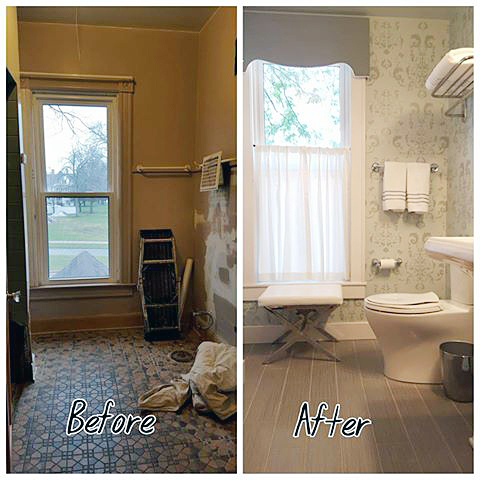 Adrienne from Dorig Designs wanted to make her guest bathroom feel attractive and inviting in her Victorian home. A stencil design is the perfect way to add pattern and personality to a space. Our interlocking wallpaper stencils make it easy and affordable to achieve a classic wallpaper look. 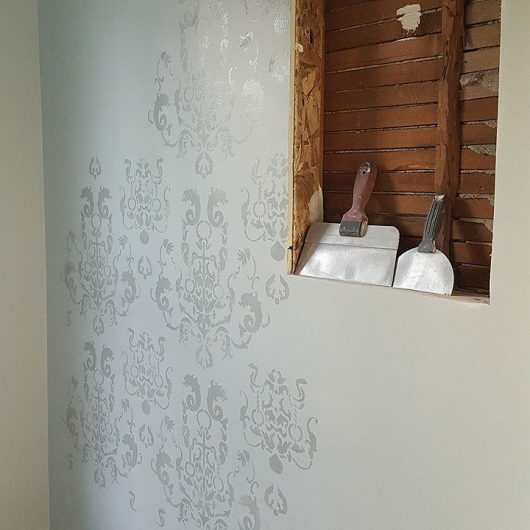 Let’s take a look at her guest bathroom makeover using our Oceana Damask Stencil. We’d like to introduce Adrienne Dorig Leland from Dorig Designs, a Wisconsin based design firm that specializes in kitchens and bathrooms. Adrienne spends a lot of time updating Clients homes and bringing their style visions to life. This time she was releasing her design charm on her own guest bathroom. Here is what the bathroom looked like before the makeover. The previous homeowner had used this space as storage. Adrienne knew it was time to give the space a fresh new look. The first thing she did was put together a design concept. She landed on a Victorian retreat by the sea. With a concept in mind, she repainted the room using Sherwin Williams Sea Salt, a beautiful coastal blue. Next it was time to add a wall pattern. Painted wall designs are a simple and affordable way to add pattern and depth to a room. She browsed our large collection of Damask stencils and fell in love with the Oceana Damask Stencil, a beautiful nautical stencil design. 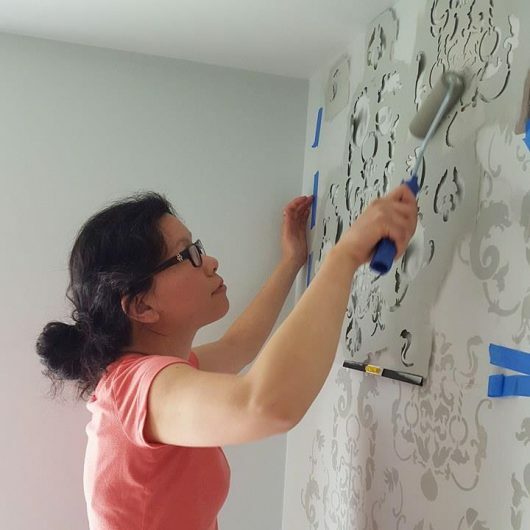 With her Oceana Damask Stencil in hand, she was ready to kick off her stenciling project! Adrienne used blue painter’s tape to hold the stencil in place while she painted the pattern using a dense foam roller. She painted the pretty pattern in Sherwin Williams Oyster Bay. After painting one section, she would un-tape the stencil and reposition it to stencil a new section. She did this until the pattern was complete on the wall. You’ll notice that Adrienne used the clip-on stencil level to ensure the pattern was properly lined up on the wall. She found this stencil tool to be extremely helpful with her project. 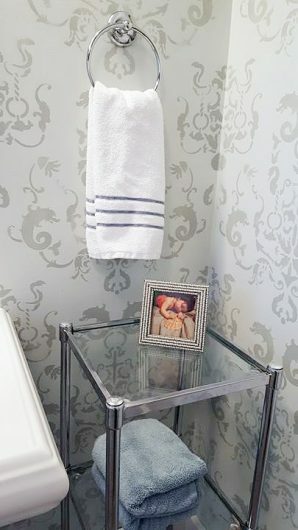 Once the whole wall was stenciled, Adrienne added new white fixtures, a custom upholstered valance, and cafe curtains. Are you ready to see how it all turned out? 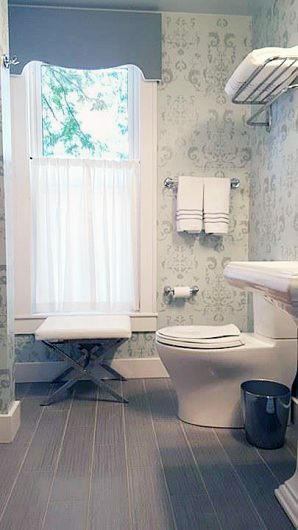 Here is Adrienne’s new guest bathroom! And you know how much we love seeing before and after photos. Here is the before and after to show how far this space has come! 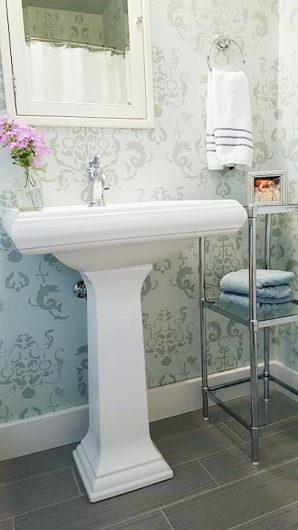 We love the subtle pattern that the Oceana Damask Stencil design adds to the bathroom. 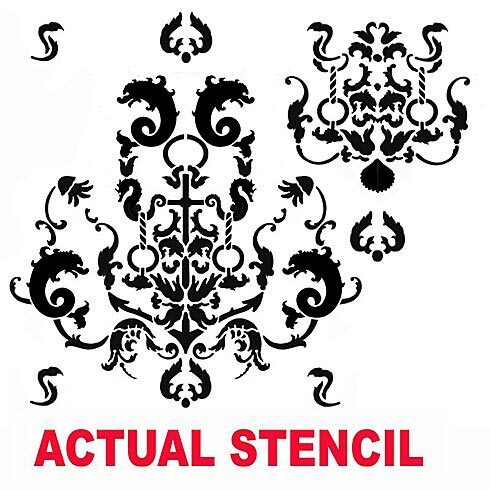 Tell us, where could you see yourself painting the Oceana Damask Stencil? Leave us a comment below, we’d love to read your thoughts! One Flower Stencil, Four Stencil Projects!